Unfortunately we did not meet the pre order goal by July 25th and we were not close enough to the goal to extend the sale time. 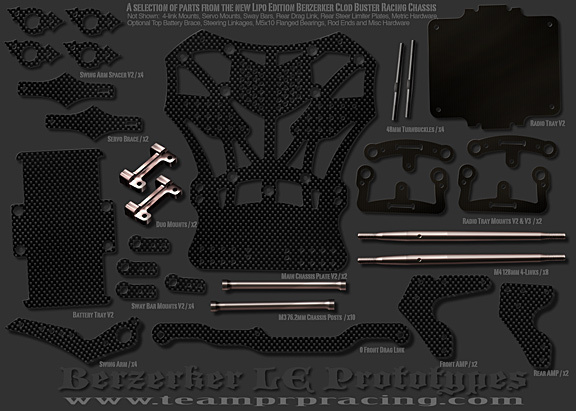 Due to the low pre order numbers we have decided to put the new chassis kit on hold. We will be looking into some other options and hope to get the new truck produced in the future. Please contact us if you would liketo be added to the Berzerker mailing list. 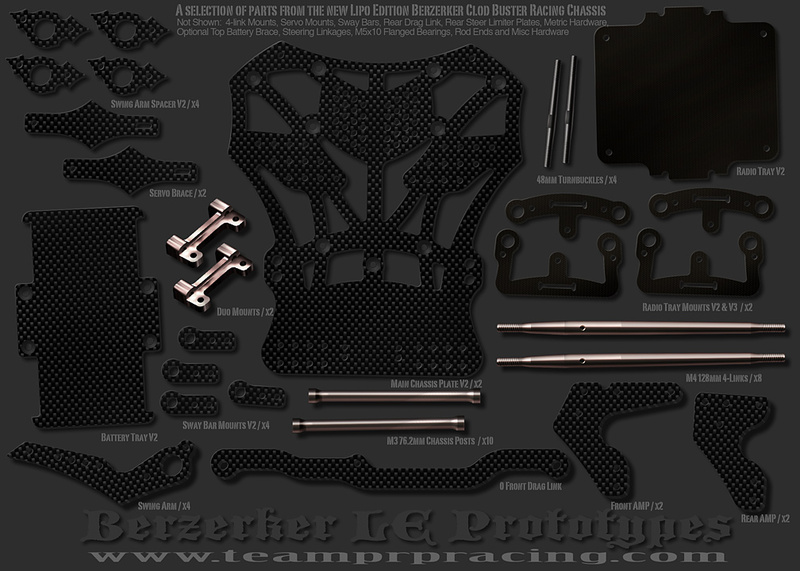 *This is a nearly complete list of components included with the Berzerker LE kit. Subject to slight changes before final production. Any updates to the list will be published when available. of the most dominant chassis kits in Clod Buster History. We are also developing a new Lipo Edition Berzerker! 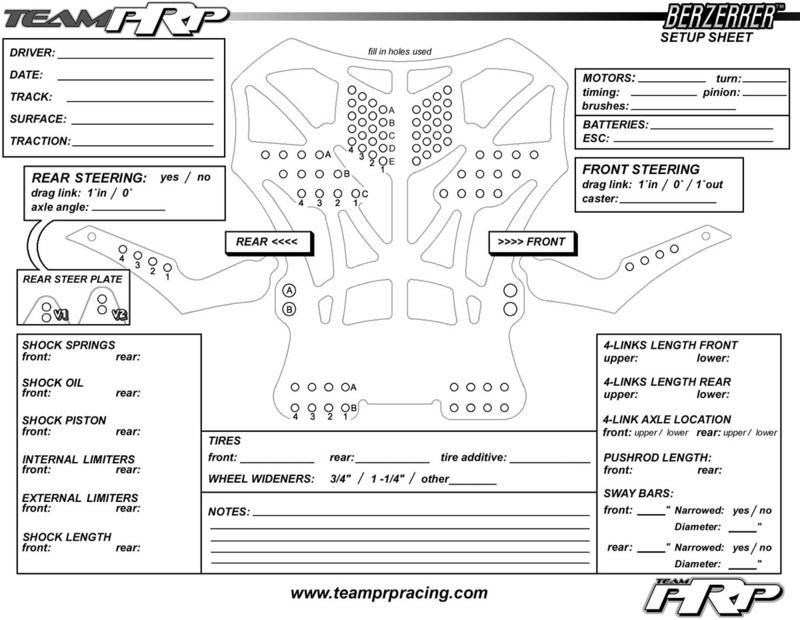 Team PRP Berzerkers dominate the Clod racing scene! Clod Buster Berzerker race chassis "Original Berzerker"
Berzerker info: World Championship winning Clod Buster chassis design. "Innovate, not recreate!" Built for the racer, this is not a back yard basher. Quality design for nearly zero slop in all chassis and steering components! Race proven design Sweeping the 2005 NRCTPA Spring Nationals and World Championships! Taking the top 5 positions at both events! We then went on to sweep the 2006, 2007, 2009 World Championships and 2012 Spring Nationals with the most Berzerkers in the top 10 at all events! (we did not attend NR/CTPA races in 2008, 2010, 2011). CNC precision machined high grade carbon fiber components, interlocking mid mounted radio tray and bottom mount battery tray, steel turnbuckle 4-link design for fine tuning wheelbase and caster. Delrin®, Carbon fiber, steel and aluminum components. Innovative rear steering design allows supreme steering control on tighter, indoor tracks. Choose the Berzerker Chassis Front Wheel Steer kit with rear lockout or the full 4 Wheel Steer berzerker kit for the championship winning setup! - Rear steering system with Rear Steer Limiter Plate brings tighter cornering with better straight line stability. ORDER: Contact us to place your order and check availability. Unlike other upper 4 link mounts out there, our design features a mounting method that will stay tight. We have run our mounts for well over a year and they are still holding tight! It stays locked in! CNC precision machined aluminum upper 4-link mounts for Clod Buster axles. Incorporates anti-wear cross link bushings and PIT BULL locking system that stays locked in! Used to win the 2004 NR/CTPA Worlds, 2005, 2006, 2007 Spring Nationals and 2005, 2006, 2007 Worlds Championships! CNC precision machined carbon fiber servo saver steering limiter plates. Adjustable plates bring ultra stable straight line speeds with the ability to turn ultra tight. Now you can run 4 wheel steer with stability more similar to 2 wheel steer trucks! A MUST HAVE for racing on tight tracks! TEAM TIP: Team PRP Recommends using the MPI Servo Reverser on your rear servo to help dial in perfect rear steer centering and also allows you to use the same servo front and rear. If you need a servo Y harness run this short Y adapter from Traxxas. The Team PRP Rear Steer Limiter will work with other 4ws trucks.